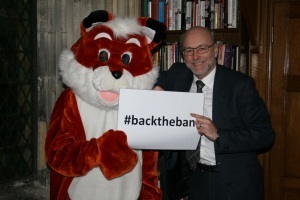 Efforts by the Government to repeal the Hunting Act or to dilute its remit are severely misguided, Alex Cunningham has said as the legislation celebrates its tenth anniversary, and would be an enormous backwards step for animal welfare. The Hunting Act, which was passed under the previous Labour government in 2004, prohibits chasing wild mammals with dogs and achieved notoriety for making it illegal to hunt foxes with dogs. The Stockton North MP was pleased to highlight his ongoing support for the legislation to mark this milestone and his commitment to improving animal welfare. Public support for the ban on hunting in this way has increased substantially in the past ten years. Polling by Ipsos MORI shows that 80 per cent of people are of the opinion that fox hunting should remain illegal while 87 per cent feel that the hunting and coursing of hares should not be decriminalised. Less than one in twenty respondents felt that badger baiting should be made legal again. And Ministry of Justice figures demonstrate that the Hunting Act out-performs all other wildlife legislation in England and Wales, having both the highest number of convictions since it was introduced and the highest conviction rate. “The Labour Party has a long and proud tradition of protecting and improving the rights of animals, and it was ten years ago today that the Labour Party finally ended the cruel and inexcusable practice of hunting with dogs. “Unfortunately, David Cameron and the Tories are determined open up the debate again. The current Secretary of State for the Environment Food and Rural Affairs, Liz Truss, recently said that the Hunting Act was a “mistake” and that she would “vote for a repeal”.